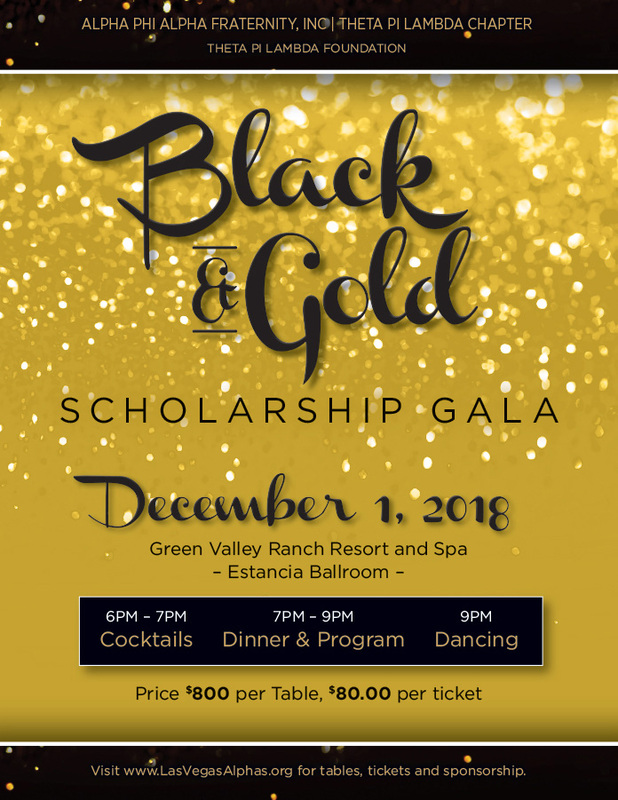 In continuing with the Fraternity’s effort to impact the community, the Theta Pi Lambda chapter in conjunction with the Theta Pi Lambda Foundation, a 501(c)3 nonprofit extension of the chapter, would like to invite you to become a partner in our annual Founders’ Day Black & Gold Scholarship Gala to be held on December 1, 2018, at the Green Valley Ranch Resort Spa & Casino. Last year we gave out a record $50,000 in scholarships to high school graduates. Please help us to continue this great tradition by participating as a Sponsor, purchasing an ad in the official Black & Gold Souvenir Journal, or making an in-kind donation (i.e., monetary, items, services for the Gala and/or Silent Auction). For your reference, pricing forms for the sponsorship packages and souvenir journal are included in this document. The Tax-Id number for the Theta Pi Lambda Foundation is 88-0408138. All contributions made to the Theta Pi Lambda Foundation are tax deductible. Should you require any additional information, please feel free to contact Keith Rogers at (702) 767-7155 or via email at Alpha.TPL@gmail.com.